I've mentioned before that I haven't traditionally been the biggest beauty product or makeup user. But in recent years, my skin has changed and I need to take care of it better than I have been. This is where Bare Blossom Skincare & Organics comes in. They offer a range of skincare and other organic products that are locally made in my home province of New Brunswick! I decided to give these products a try after seeing a few posts on Facebook about them, and that they offered a "sample pack", which offered some sample sizes of a lot of their products, so it was an opportunity to try a number of products without committing to full size. 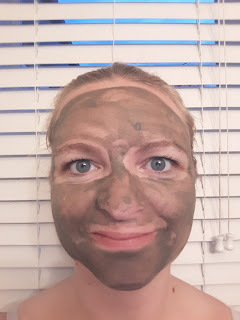 The first product I tried was the "Goddess Face Mask". The texture is very similar to "mud". It can dry out a little if not used right away, but just adding a tiny bit of water and working it through gets it ready for application. You Could Win a $150 Nordstrom Gift Card! When it comes to shopping for Fall, the focus is always on kids and their "Back to School" items, but sometimes Mama needs some new clothes too! I love Nordstrom because they have some great items, with many different brands and styles. There's something for everyone! Don't need anything for yourself? They also carry men's clothing, children's clothing, beauty products and home decor. So much to choose from! That's why I've teamed up with some fantastic bloggers to give you all an opportunity to win a $150 (US) Nordstrom Gift Card! See below to enter! GIVEAWAY DETAILS Prize: $150 Nordstrom Gift Card Giveaway organized by:Oh My Gosh Beck! Rules: Use the Rafflecopter form to enter daily. Giveaway ends 8/18 and is open worldwide. Winner will be notified via email. Are you a blogger who wants to participate in giveaways like these to grow your blog? Click here to find out how you can join a totally awesome group of bloggers! Why Are You Posting Sweaty Selfies? The title of this post is a question I actually was asked a couple weeks ago. That's when I started posting post workout pictures on my Instragram (and sometimes my Twitter and Facebook pages). It's a strange thing to do, I know. But I thought I would share my thinking behind it. One of my many Instagram posts. So, I don't know about anyone else, but I have started noticing that the "Back to School" signs are up in stores already! Didn't school just end??? Well one of my favourite places to do my back to school shopping is Amazon! They have everything! It's a one stop shop for so much of what we need! I can take the school supply list and find everything from the comfort of my home. And as a bonus, you can also purchase clothing..... and maybe add on a little something for yourself. You deserve it! I've teamed up with some bloggers to offer you an opportunity to get some shopping done with Amazon with this $200 Amazon Gift Card giveaway! Have you ever started packing for a summer getaway and realized you don't have as many summer clothes as you thought you did? This happened to me last weekend. Well I would like to help you out with that. I've paired up with some fantastic bloggers to giveaway a $150 (US) Urban Outfitters Gift Card! A good way to get some shopping done, right? To top it off, there are some great items on sale on their website as we speak! And, did you know they also sell decor? So if you aren't in need of clothing, there's still lots to choose from! Check out the giveaway below, and don't forget to enter often! There are lots of opportunities to earn ballots! Good luck! I've had an Instagram account for a long time, but I only just recently started to use it more. I share content on my Instagram that's a little different than my other social media channels. I tend to share more pictures of my travels, as well as my fitness journey - something I have struggled with. How do you use your Instagram? Are they similar posts to what you share on your other social media accounts? If you've never checked out my instagram, here's an opportunity to check it out AND gives you a chance to win a prize! I've teamed up with some bloggers to giveaway a $150 (US) Target gift card. For my Canadian readers, I know the Canadian Target folded up shop, but I know there are many (myself included) that still enjoy shopping at Target on visits to the US. What would you spend the gift card on if you won? I'm fairly new to the makeup "scene". I went many years without wearing any makeup at all. I wish I could say there was some high and mighty reason why I wasn't wearing any, but the truth is, I never really knew how to put it on properly. But now we live in a day and age of makeup tutorials, and I've watched my fair share. I'm still learning. And I even posted a tutorial of my own (check it out on my YouTube page: Overtired Mama's YouTube Page). Anyone who uses makeup has undoubtedly heard of Sephora. Just the name sounds amazing. Well I've teamed up once again with a number of bloggers to give you all an opportunity to get yourself some Sephora! This giveaway is for a $150 Sephora gift card! What would you purchase first if you won? For your opportunity to enter, and to check out my amazing co-hosts, have a look through the information below.